Some people may find that having small children in their wedding party can be stressful. Although this can be true in some cases, I believe that including kids in the big day provides everyone with entertainment and breaks the tension that comes along with the nerves and stressful moments. I have met many flower girls and ring bearers at the weddings we have attended, and all of them bring personality to the day and put a smile on people’s faces. Not to mention, kids are adorable. Why wouldn’t you want that at your wedding? This particular photo was taken during a lovely outdoor ceremony at Cobble Beach in Owen Sound, Ontario. The ceremony was held on the green of the golf course, over looking Georgian Bay. All of the bride and groom’s friends and family were excited to see the happy couple say their vows, but not as excited as this little girl. 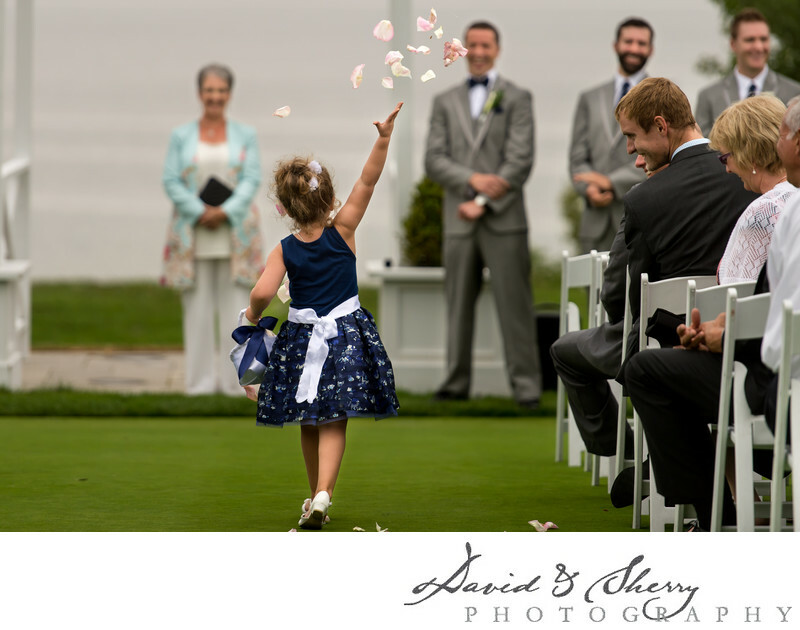 She took her job of throwing petals very seriously and was extremely enthusiastic as she tossed her flowers in the air. Of course the sight of this brought laughter to everyone in the audience, including the officiant, and was the perfect lead-in before the bride walked down the aisle.